NOW AVAILABLE AS A DOWNLOAD! 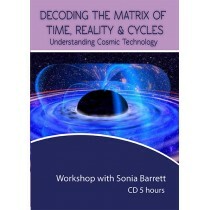 This 5 hour workshop took place March 2012 in Los Angeles. It was an amazing experience! Reality is a construct of the imagination. We live our lives in fear of running out of time as we no longer understand the time matrix. Much energy is spent looking outside of ourselves yet there is a natural inner process which exceeds our illusionary beliefs of time, space and the movement of cycles. There are protocols and realizations about the nature of reality that are essential tools in aligning spirit, mind and body. Life is experienced through a profound science revealed to us in stages according to our desire to push the envelope. What we are beyond these physical bodies far exceeds much of the limiting beliefs created as a safe haven. Spirituality is the dance of energy via cosmic technology. Understanding this technology will greatly assist us in remembering that we are the ultimate programmers of our lives. Our perceptions are influenced by a specific set of conditions and codes by which the universal system operates. It is the robotic self (the subconscious mind) that drives our auto pilot lives. Becoming masters of this interchangeable system is a natural part of human evolution once we are ready to explore possibilities which surpass common thought. This workshop/lecture will go beyond much of the topical approach to self-exploration. Many remain challenged by relentless patterns and experiences despite years of self-healing practices. The playground of creation surpasses our quest for a packaged life of joy and contentment and instead offers us an ocean of untapped possibilities. This workshop is for those who are ready to explore outrageous capacities in becoming more than our programmed potentials. We are in an age where technology is rapidly being integrated into human evolution. It is therefore essential that we begin to exercise our natural abilities to activate memory of this natural inner technology. To simply engage in feel good concepts only serve to establish short term changes causing us to return repeatedly to a place of dissatisfaction and uncertainty. The blueprint established for the collective human experience is one with boundaries yet it is alterable by those who seek earnestly to step beyond those boundaries. What are our personal boundaries in creating reality?